A frantic search is underway for a New York couple who took a vacation to the Caribbean, and suddenly vanished, with no sign of them for nearly two weeks. Orlando Moore and his girlfriend, Portia Ravenelle, flew out of Newark Liberty International Airport on March 23 for a getaway in the Dominican Republic. They were supposed to return home to Mount Vernon on March 27. Thirteen days later, their family hasn't heard from them. Their phones are off. And their car is still parked at the airport. Moore's sister, Lashay Turner, said her first move was to reach out to the U.S. Embassy in the Dominican Republic. Then she filed a police report. Cops say the pair checked out of their hotel in Samana, but what happened to them next remains a mystery at this point. Officials say they didn't make the flight back to Newark, and there's no record of them getting back to the U.S.
U.S. Customs and Border Protection declined comment, saying privacy concerns preclude them from discussing individual cases of international travelers. The U.S. Department of State said it was aware of the case and working with local authorities searching for the pair, but could not comment further. "When a U.S. citizen is missing, we work closely with local authorities as they carry out their search efforts and share information with families however we can," a U.S. Department of State official said in a statement. "The welfare and safety of U.S. citizens abroad is one of the highest priorities of the Department of State. We stand ready to provide appropriate assistance to U.S. citizens in need and to their families." Turner said her brother and Ravenelle had a rental car in the Dominican Republic, but that vehicle is missing. 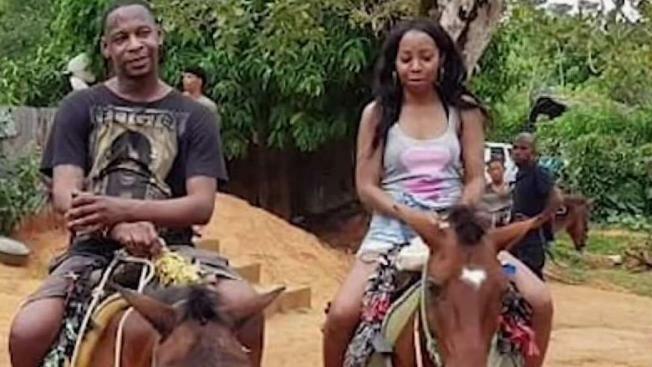 A picture believed to be the latest of them posted to social media before they vanished shows them riding horses together on their trip. Turner says her brother has a daughter -- and he's not the type to "just run off on a hiatus ... he's gonna let someone know where he is." "I'm scared. I don't know what's going on," she added. "I'm saddened, my family is saddened by this and we just want me brother to return safe and alive." Authorities aren't speculating about what may have happened to the couple, but relatives are growing increasingly concerned. "When these things happen, you always think of the worst, but we are hoping for the best," Edith Walters, Moore's grandmother, said.